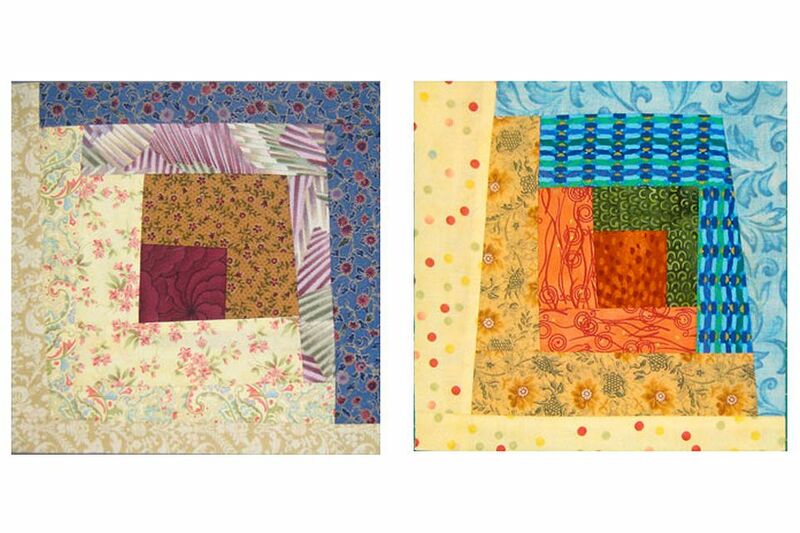 Sew a batch of whimsical quilt blocks with this wonky log cabin quilt block pattern. Blocks are sewn using basic string piecing techniques, but with a plan. Not an exact plan, but with simple steps that you can alter to create one-of-a-kind log cabin quilt blocks. String piecing is one form of foundation piecing, which quilters often refer to generically as paper piecing. But strings are much less fussy than some other methods that fall into that category because there's no need to sew a precise seam, use exactly-sized strips or flip a foundation over to sew on a line. You'll find that the wonky log cabin quilt block can be customized to create a variety of looks. Read string piecing basics before you begin if this will be the first block you've made using the technique, and to become accustomed to a few of the possibilities for this quilt block. Start with the suggested foundation size and strips. After making a couple of wonky log cabin blocks, customize the components to suit your needs. The instructions show you how to sew a block similar to the version on the left in the photo above. Cut a 9" x 9" foundation from muslin or any other prewashed cotton fabric. Inexpensive fabrics are sometimes a bit thinner than typical quilting cottons and work just fine, but keep in mind that very dark/bright prints used for a foundation could show through the light log cabin strips. Cut a dark or warm (red is traditional) square of fabric, about 2-1/4" x 2-1/4" for the block's center (does not need to be exactly that size or even a precise square). Choose three fabrics that blend with each other but are lighter than the square. Cut a strip of each. Required lengths vary depending on their eventual placement, but cut each one at least 18" long (you'll have leftovers that can be used in additional blocks). Strip widths can vary -- try cutting one 1-1/2" wide, one 2" wide and the third 2-1/2" wide (strips do not need to be exactly those widths). Choose three darker fabrics (or warm fabrics that will pop out) that blend with each other but contrast with the light strips and can either contrast or blend with the cut square. You'll need about 18" total of each. Vary widths again. Use 1/4" seams. There's no need for seams widths to be a perfect 1/4", but make each seam a consistent width so that fabric doesn't pucker along any given length. Place the center square right side up on either side of the 9" x 9" foundation (or the lightest side if the fabric is a print). You can position the square at the center of the foundation or arrange it off-center. Secure fabrics with a straight pin if you like. Place one of your dark strips right side down along the right side of the center square, aligning the edges of the strip with the square's top and right edges (the reverse side of my dark appears light, but looks very different when flipped right side up). Sew a seam along the right edge, starting and stopping a stitch or two beyond the beginning and end of the center patch. Flip the new strip right side up and trim its tail even with the bottom of the center square. Press (or finger press) in place (the little wooden sticks used for foundation piecing work nicely, and so do the tiny electric hand-held irons). Place the partial block in front of you, the new strip to the right. Place a strip of the second fabric across the top edge of the two sewn patches, aligning the top edge of the strip along the left edge of the original square and the length of the strip along the entire width of the two patches. Sew a seam along the aligned length of the strip. Trim the tail of the long strip to match the patches below (if you prefer, you can trim strips before you sew). Flip right side up and press. Add two light strips using the same technique used to sew the first two dark strips. For this version of the Wonky Log Cabin quilt block, you'll continue to switch back and forth, adding two darks, then two lights, and moving in a circular manner. Position the first light strip right side down along the combined edge of the strip you just sewed and the original center. Sew a seam and trim tail if necessary. Flip up and press in place (left photo). Add two more light strips, moving around the center as before. Next, add the last two dark strips. Finish by adding the last two light strips. Use narrower strips, adding more rows on each side of the center square. Make the center square very small if you prefer, or make it a rectangle. Remember that the outer strips of the block will be reduced by 1/4" when you sew blocks to each other -- super narrow strips might become invisible. Don't use a dark/light scenario. Instead, sew four strips around the center with the same contrasting fabric (light or dark, depending on the center); sew the next four strips from another, contrasting fabric. Continue to create a series of contrasting squares. Go very scrappy with all of your strips. If you decide your strips are too wide as you add them to the block, move your next strip inward, aligning it midway over the previous strip, rather than along the previous strip's edge (you will cover some "tails" of other strips when you do this). You can assemble a wonky log cabin without a foundation by sewing patches to each other in the same manner, but I like the stability that a foundation provides for the stretchy bias edges that always result when you work with angled patches. Once you begin making these blocks, you'll find all sorts of ways to improvise. Have fun with it. There are no rules.